TEENAGER NICOLE TURNER continues to be Ireland’s leading light at the Paralympic Games after finishing seventh in the final of the 200m Individual Medley. On a day when temperatures peaked at 32 degrees celsius in Rio, the 14-year-old was the only Irish athlete to perform to her potential as others toiled in the searing sun. Save for Turner, who clocked a time of 3:18.18 in her third final of the meet, there was disappointment across the board after Jason Smyth, Eoghan Clifford and Michael McKillop had got the team up-and-running over the weekend. A time of 3:18.18 saw Turner come home in eighth but the disqualification of Ukrainian Yelyzaveta Mereshko meant she was bumped up one place. “I’m really happy with that swim,” she said afterwards. The race was won by Great Britain’s Ellie Simmonds, who broke the world record by becoming the first swimmer to clock under three minutes in the discipline. Much like this morning’s heat, Turner started strongly and was in a good position after the opening butterfly leg. Her weakness, however, is backstroke and she faded fast to leave herself with too much to do to claw her way back. Meanwhile, there was disappointment for James Scully on Monday morning after missing out on a place in the final of the S5 5om freestyle despite swimming a personal best. The 23-year-old’s time of 37.38 proving just outside the qualification mark as he was forced to be satisfied with seventh place overall. Helen Kearney was forced to settle for 20th place in the 25-rider field of the opening round of the Grade 1a dressage competition. The Wicklow woman competes next in the Individual Championship on Thursday, which is a stand-alone event in which she won silver in London 2012. The Irish boat made a good start in Race 1, sixth round the first two marks and then improved to fifth at third mark but slipped back five places on the charge for home. In Race 2, they struggled from the outset, reaching the first mark in 12th position before slipping to 14th. At the Olympic Stadium, Deirdre Mongan couldn’t hide her frustration at failing to produce her best form in the F53 shot put competition. The Galway native finished fifth out of six and admitted afterwards that she struggled to deal with the warm conditions. Her best effort of 4.04 metres was along was off the mark. Finally, Sean Baldwin’s struggles at this Games continued as he was left to rue a bad start after missing out on the final of the 50 metre 3-position shooting event. A 20th place finish left a lot to be desired. 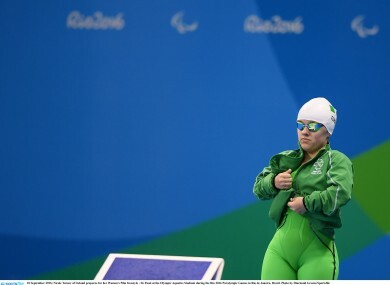 Email “Ireland's athletes toil under the searing Brazilian sun but swimming star continues to shine”. Feedback on “Ireland's athletes toil under the searing Brazilian sun but swimming star continues to shine”.